The folding chair, made of maple, is of the camp style with the bent crest rail capped with carved and engraved eagles and with a bent back splat. S-curved rear stiles, carved and bent arms are hinged to rear stiles and front seat list. Carved dogs sit on the top front of the arms. The rose colored cotton brocade seat is slung between front and rear seat lists. Curule form legs pivot in the center to fold. Ball and baluster turned front and rear stretchers. Stamped into the wood, “Presented to Captain J. C. Herkner, as a token of respect, by his company, 1st Michigan Engineers and Mechanics, J. J. 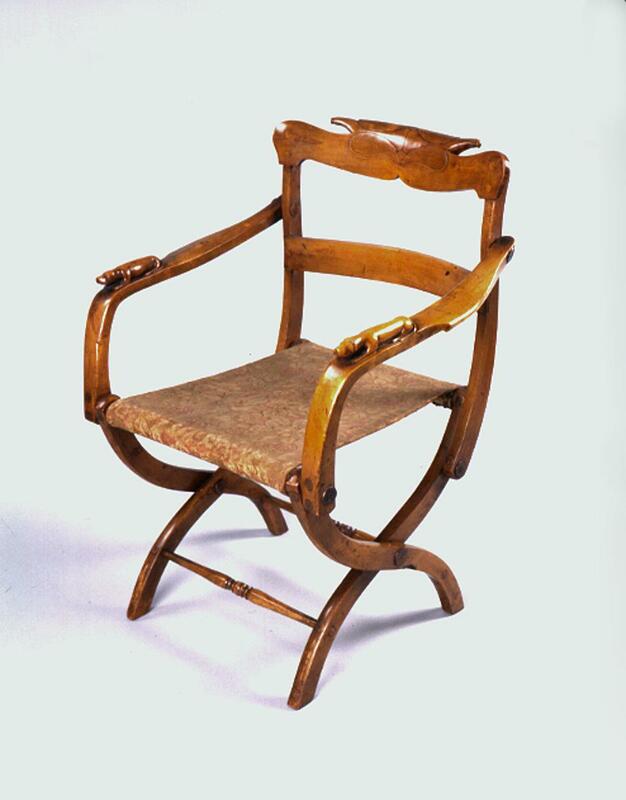 Green, Maker, Company B.” Campaign chairs like this were common among Civil War officers. They folded up to allow for easy packing and moving from place to place. The chair was donated to the Grand Rapids Public Museum by Miss Elizabeth Herkner, daughter of Joseph C. Herkner. The measurements of the chair are: 31 in. high, 23 in. wide, 20 in. deep.